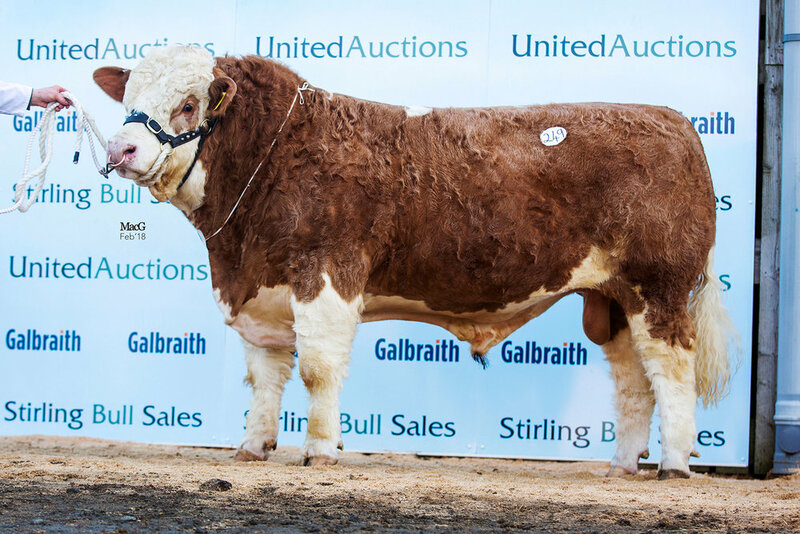 116 Bulls sold through the ring to average £5477, and a clearance rate of 82% was achieved, once again the breed sold the highest amount of bulls through the Stirling Spring sales fortnight. Topping the day’s trade at 24,000gns was the Reserve Junior Champion Islavale Heston 16 bred by Mr W S Stronach, Berryleys Farm, Grange, Keith, Banffshire, AB55 6LN. A Ranfurly Confederate C24 son out of an Curaheen Bandit daughter, he was purchased by Richard McCulloch, Overhill House, Armadale, West Lothian, EH48 3AR. Second top price at 16,000gns was Islavale Harvest 16, also bred by Mr W S Stronach, Berryleys Farm, Grange, Keith, Banffshire, AB55 6LN. Another Ranfurly Confederate C24 son out of a Woodhall Walker daughter, he was purchased by W H Robson & Sons, 106 Cogry Road, Doagh, Ballyclare, County Antrim, BT39 0PX. 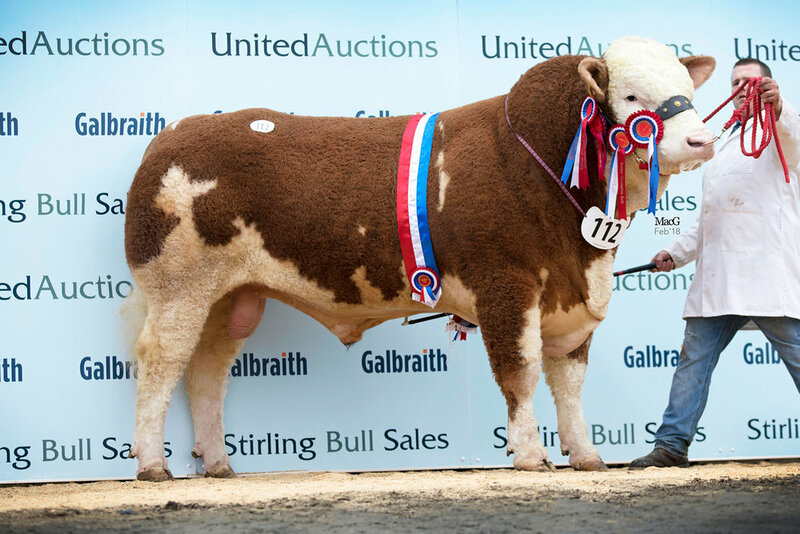 Next at 12,000gns was the Intermediate Champion Camus Harold 16 bred by Mr J Campbell, exhibited by Mr H C Stubbs & A A Burleigh, 48 Innisrooisk Road, Crummy, Ballindarragh BT92 0PJ. A Kilbride Farm Newry son out of a Dirnanean Apostle daughter he was purchased by M/S J H & V G Wood, Popes Farm, Longridge Road, Dutton, Preston PR3 2YT. Selling for 10,000gns was the Senior & Overall Male Champion Islavale Hugo 16, bred by by Mr W S Stronach, Berryleys Farm, Grange, Keith, Banffshire, AB55 6LN. This Islavale Echo son out of a Chestermann Varney daughter was purchased by W J Barclay, Whiteknowes, Deskford, Cullen, Buckie AB56 2YN. Also, selling at 10,000gns was Kilbride Farm Haka 16 bred by W H Robson & Sons, 106 Cogry Road, Doagh, Ballyclare, County Antrim, BT39 0PX. A Kilbride Farm Warren son out of an Crugmelyn Brenin daughter, he was purchased by Mr W J & J Green, Corskie, Garmouth, Fochabers, Moray, IV32 7NN. Selling for 9,000gns was Blackford Hurricane 16 bred by Mr W G MacPherson, Blackford Farm, Croy, Inverness IV2 5PS. A Hockenhull Waterloo son out of a Kilbride Farm Strabane daughter, he was purchased by Mr & Mrs P B & J A Borlase, Sacombe Hill Farm, Sacombe, Watton at Stone, Herts SG14 3NL. Selling at 8,000gns was Woodhall Hugh 16 bred by H & J Macaskill, Woodhall Farm, Innerwick, Dunbar EH42 1SH. A Curaheen Emanuel son out of a Steinadler daughter he was purchased by Delfur Farms, Dundurcas Farm, Rothes, Aberlour, Banffshire AB38 9RB. Next, selling at 7,800gns was the Reserve Intermediate Champion Pitmudie Houston 16, bred by Heather Duff, Pitmudie Farm, Brechin DD9 7UH. An Overhill House Eragon son out of an Omorga Volvo daughter, he was purchased by W & J Brown, Hilton of Culsh, New Deer, Turriff AB53 6TQ. Three bulls then traded at 7,500gns. First was the Junior Champion Corskie Harry 16 bred by Mr W J & J Green, Corskie, Garmouth, Fochabers, Moray, IV32 7NN. This Dirnanean Bradley son out of a Ballinalare Farm Nightrider daughter was purchased by Newton Farms, Mains of Newton, Craigellachie, Aberlour AB38 9RB. Next at 7,500gns was Wolfstar Humdinger 16 bred by Mr A King, Wolfstar, Ormiston EH35 5NH. A Team Celtic son out of a Hiltonstown Soloman daughter, he was sold to Colin Inglis, Craegorry, Dalachy Farm, Aberdour KY3 0RL. 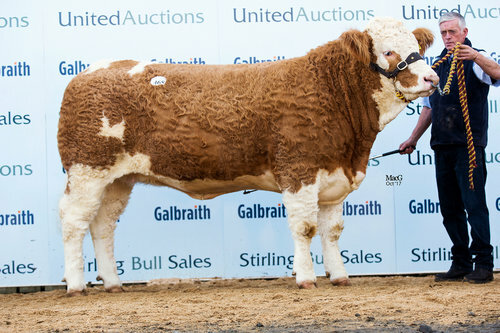 Also, selling for 7,500gns was Woodhall Herbie 16 bred by H & J Macaskill, Woodhall Farm, Innerwick, Dunbar EH42 1SH. A Knockreagh Dandy son out of a Woodhall Volcano daughter, he was sold to Mr N F McGowan, Incheoch Farms, Alyth, Blairgowie, Perthshire PH11 8HJ. Topping the trade for females at 6,800gns was Strathisla Honesty’s Twiggy bred by Strathisla Farms, Moolies, Meigle, Blairgowie PH12 8RF. This Islavale Donald daughter out of a Dressogue Victorious daughter was purchased by Harte Peat Ltd, Leonards Island, Clones, Co Monaghan, Ireland. Second top price at 6,000gns was Strathisla Hawthorn’s Harriet also bred by Strathisla Farms, Moolies, Meigle, Blairgowie PH12 8RF. Again, an Islavale Donald daughter out of an Omorga Samson daughter she sold to Gary & Jonny McCammond, 21 Maghereagh Lane, Randalstown, County Antrim BT41 4NR. Reserve Female Champion and selling at 4,000gns was Newbiemains I’m Brilliant, bred by Jim & Patricia Goldie of Newbie Mains Farm, Annan DG12 5QY. A Newbiemains Empire daughter out of a Monaduff Vision daughter, she was purchased by J H Logan & Co, Dalfask Farm, Girvan, Ayrshire KA26 0TS. 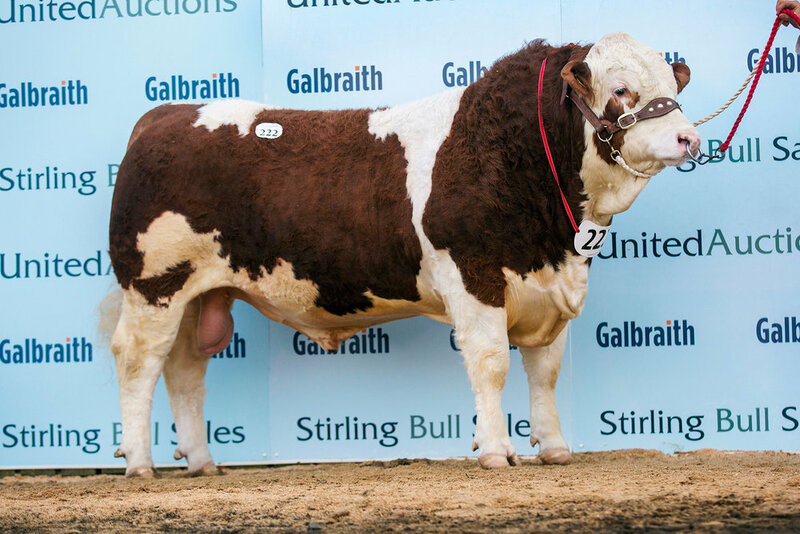 A major reduction of the Woodhall herd (H & J Macaskill) was held at Stirling on Monday 19th February 2018 which saw the majority of the autumn calving herd being offered for sale. Fetching the top price of 14,000gns was Woodhall Flair, a Curaheen Comanche daughter out of an Annick Talisker daughter, she was purchased by P McDiarmid & Co, Shenlarich, Lawers, Aberfeldy PH15 2NZ.